My family loves nilaga like this nilagang baboy. This type of recipe are soupy kind of food dish and if we have this recipe on our table, my kids quickly finish their meal and ready to go to their next activity, which is playing. 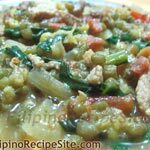 I remember back then that we used to have this dish (we call it nilat-an in our bisayan dialect) during Sunday’s lunch together with my in-laws every weekend. 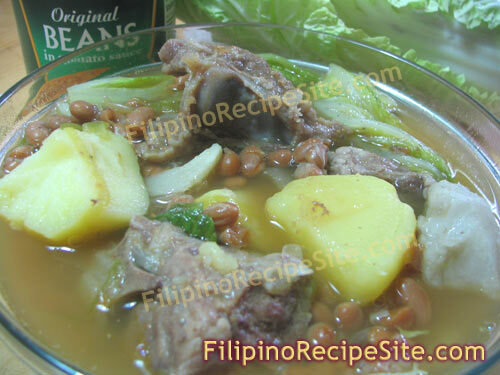 Anyways, Nilaga in filipino means ‘boiled’ and one of them is this Nilagang Baboy which is another filipino recipe that is easy to make that you just throw everything in the pot and let it cook until tender. 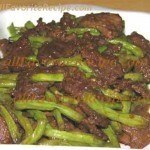 Aside from pork, you can use beef, shrimp or any kind you like and just add any vegetables of your choice. 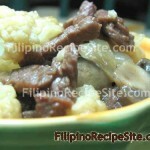 Me, personally like to add Corns and ripe saba (banana plantain) in cooking this filipino dish. 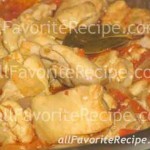 I sometimes add pork and beans, and even add a thumb-size ginger for a pungent flavor. Place pork in a big pot and let it covered with water. Bring to a boil. Lower the heat and let it simmer until pork is tender for about an hour. Remove all the resulting scum that will rise to the top of the pot. Add crushed garlic, sliced onions, scallions, peppercorn and season with salt. Add quartered eddoes (if using) and potatoes. Cook until tender. Add the pork and beans. Simmer for 5 minutes. Correct the seasoning. 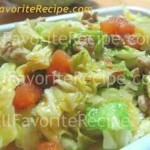 Add pechay or cabbage leaves. Do not overcook the green vegetables. Remove from heat. Serve hot. Wahh! I miss pork. Thanks kabayan! pag uwi ko galing dito KSA, itong unang una kung ipapaluto sa aking misis.